Nissan Skyline R34 Buggy Car. Fast and Furious built and destroyed a lot of cars. Every main character car, depending on how it is used, is copied three to six times or more. Some are setup for just one particular scene. This particular R34 GT, was dressed up to look like the hero R34 GT-R for Fast and Furious 4. 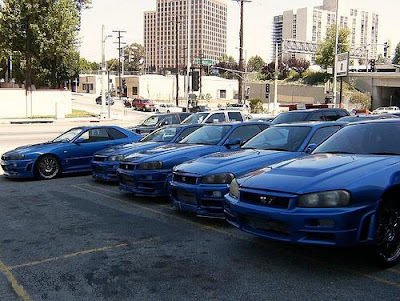 The fourth movie saw the return of Paul Walker, and the blue R34 GT-R was a car he drove in one race scene. In the scene, he gets off track, and has to drive down a freeway embankment. Seeing as a Skyline is not really an off road car, the picture car department built a "Buggy Car." 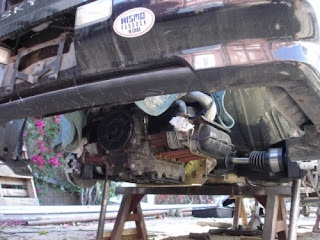 They removed the entire driveline from one of the stunt cars, and put it all over the top of a VW chassis. From our friends on set, they said they did the embankment with one of the other stunt cars, and didn't even use the buggy car. By the sound of the thing, I expected a 1000 hp V8 to be in there! It actually would sound intimidating at a stop light LOL!!!!! Talk about a bark worse than a bite! Holy geez!!! Now i can say my car is faster than am R34! Yesssss!!! that car is a beauty. i want to get my hands on an R34 soon.